Orienteering began in Sweden as a family activity. Since then, it has grown into a sport in its own rite. In Europe, most orienteering is done at the professional and club level, with competitors representing teams and competing in regimented divisions. While such competitions do exist in the United States, orienteering here is mostly enjoyed as it began, a recreational activity. Orienteering is a sport in which runners use an accurate, detailed map and a compass to find points in the landscape. It can be enjoyed as a walk in the woods or as a competitive sport. A standard orienteering course consists of a start, a series of control sites that are marked by circles, connected by lines and numbered in the order they are to be visited, and a finish. The control site circles are centered on the feature that is to be found; this feature is also defined by control descriptions (sometimes called clues). 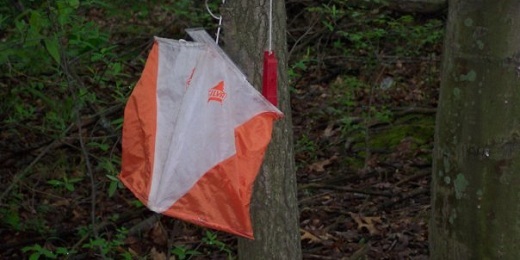 On the ground, a control flag marks the location that the orienteer must visit. To verify a visit, the orienteer uses a punch hanging next to the flag to mark his or her control card. Different punches make different patterns of holes in the paper. The route between “controls” (refers to the flag or the site) is not specified, and is entirely up to the orienteer; this element of route choice and the ability to navigate through the forest are the essence of orienteering. I ran in my first competition in September 1999. I went to Hichory Run State Park in Pennsylvania for two days of camping and fun – it was a blast. Not only was this my first time competing in an race – I also ran together in a night orienteering competition.